Nothing would make me happier than 100% of our riders clicking $1 extra every time they register on http://www.bikereg.com to race. The funds are divided equally and directly to Big Marsh, West Town Bikes, and Blackstone Bicycles. Please click $1 donation. This is $0.33 each time you race for each of our partners. I noticed something “interesting” in the data. The hopkins park lap times for Cat4/5 Women were faster than the Cat 1/2 women and identical to the junior 15-18. Conclusion. Someone is entering all this data by hand. Now THAT is selfless dedication to the CCC. I noticed this same thing with some races in Colorado last year so I did some research with the chief scientist at Best Bike Split – it turns out that on grassy courses when the temperature is lower the grass will lay flatter and the ground will be harder such that the rolling resistance is so much lower for earlier categories they can go much faster than later categories when the grass plumps up and the ground softens. 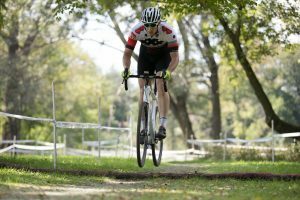 Trek CX Cup preview… now with triple the flyover fun!